The best hockey training tools made. Hand made from recycled hockey sticks. Modern composite sticks are very strong, very light, very cool looking, and very expensive. Sadly, they also break. And, in most cases, once broken, they are pitched aside, only to wind up in a landfill. ReUstix™ is a family-owned small business that was founded to address a simple challenge: how can the enormous numbers of broken composite hockey sticks be turned into something useful to the hockey player and the hockey community? We started with a simple, straight stick, elevated on hockey pucks and risers to accommodate both pucks and the market-leading off-ice practice pucks and balls. This classic obstacle, the TrixStick, allows players to practice accurate puck dribbling, back- and fore-hand sauce, wide pulls, etc. Because of their weight, the pucks provide stability to the tool, but also provide a floor-friendly base for indoor use. 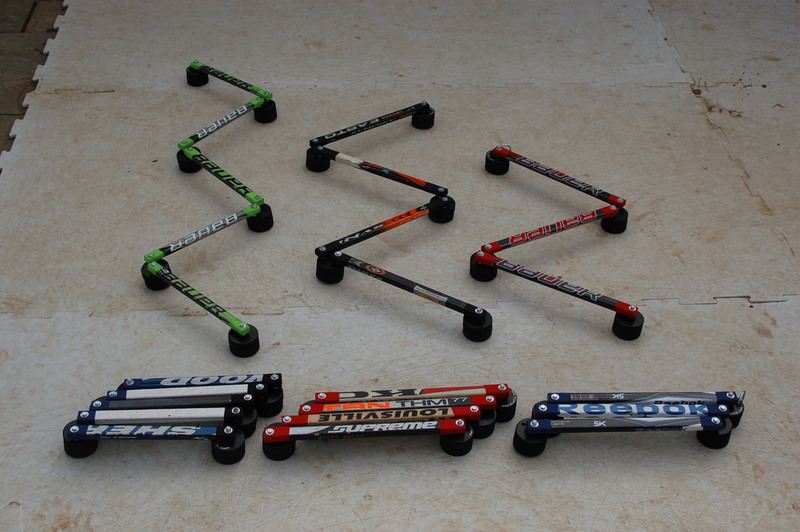 From here we developed a range of stick handling training tools to provide portable, flexible, and robust obstacles for both on- and off-ice training. These include 3-, 4- and 5-segment FlexSticks and the timeless Training Triangle. Available in a range of sizes, players and coaches love the portability and versatility that our training tools provide. But what about fans and families? While committed to supporting player development, ReUstix has also developed a wide range of hockey lifestyle products for hockey lovers of all ages. Perfect for coaches and managers gifts, player gifts, or for road-weary parents making the best of the time spent in numerous parking lots, our stuff has been carefully designed to celebrate hockey while making great use of broken sticks! Our tailgate collection strives to make your game-day time as enjoyable as possible. The collection includes a folding tray table, the most sustainable cooler in the world, ring toss, corn toss and even beer pong/folding travel tables! We have added a snappy little box purse for the hockey moms among us, too. Our Man Cave Collection takes things to a whole new level. We have designed beautiful yet robust coffee tables, matching end tables, and the coolest lamps on the market for the player's bedroom, the coaches basement, or the students dorm room! We have added a serving tray and TV table for the neater basement dwellers, and have designed table-height stools and counter-height tables for in-home bar or dining use! Designed with rink viewing areas, team lounges, and team front offices in mind, we have adapted our Man Cave Collection for high-traffic or high-impact areas. Built from premium hardwoods and optionally including steel legs, these spectacular pieces will inspire players, recruits, fans and donors alike! What to do with all these broken sticks?